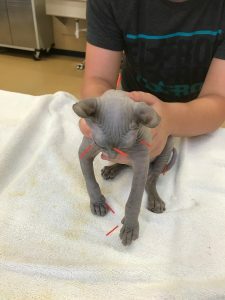 Abstract: Upper respiratory infection with herpesvirus and concurrent pneumonia in an 8 week old Sphynx kitten. 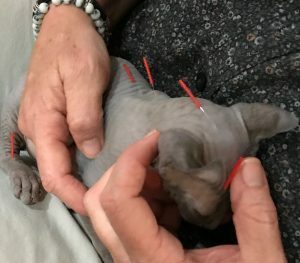 In conjunction with traditional western medicine, acupuncture was applied in this case to neuromodulate and improve immune function, increase appetite. Significant improvement in appetite, attitude and conjunctivitis was observed. 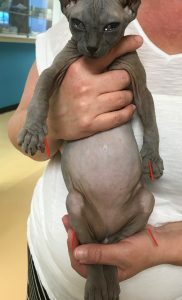 History and Presentation: 8wk male Sphynx presenting for worsening severe conjunctivitis (R > L), progressive congestive upper respiratory signs. Patient (p) was diagnosed radiographically with pneumonia on 7/9 by primary veterinarian. P was recently adopted from a breeder. 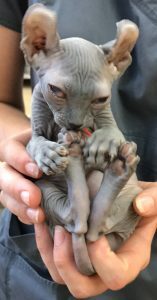 No other kittens at/from breeder are affected. P appetite has been decreased, won’t eat canned food but is still eating some hard food. P does gorge/take large mouthfuls of food when eating normally. P is currently hospitalized for upper respiratory infection (URI)/pneumonia. Medications include IV fluids, ofloxacin drops q6h OU, erythromycin ointment q6h OU, cidofovir q12h, artificial tears q6h OU, oral doxycycline 100mg 1/8 tab PO q12h and baytril 22.7mg 1/8 tab PO q12h. Whole body radiographs – significant thoracic findings include right middle and left caudal lung lobe pneumonia. Whole GI distended with gas, possible GI stasis. Medical Decision Making: Plan to use lung mu/shu points, protocol for lung inflammation including electro acupuncture. Points to stimulate appetite and immunomodulation will be used also. Neuromodulation of connective tissue was achieved by stimulating local points and central/autonomic points to help return to normal homeostatic function. The ANS input to lymphoid tissues helps in the case of immune function, and those cells show receptors for hormones and neurotransmitters. There are effects in the local tissues from the autonomic neuromodulation including minimal inflammatory response, mast cell degranulation and immunomodulatory effects. 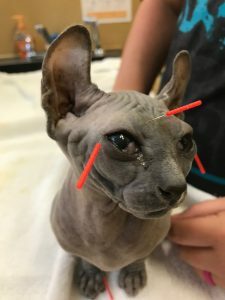 Outcomes, Discussions, and References: About 15 minutes after first tx p ate dry food with enthusiasm and even willing to eat wet food which he hadn’t eaten in several days. Able to discontinue oxygen. By second tx p much more active and mobile than prior tx, p was eating very well on his own. Conjunctivitis looked significantly improved, but still present. Due to scheduling there was a gap in tx and in that 2 week span his ocular recovery slowed. The conjunctivitis was the least responsive of the 3, but still seemed to improve significantly. The activation of the ANS and the calming effects of some of the points chosen are likely most responsible in the increased appetite and attitude, as traditional tx had been going on for several days with no significant changes. Conjunctivitis improvement was likely due to the local tissue effects in conjunction with the ocular meds.